With macOS 10.14 Mojave, Apple introduced new privacy protections similar to the existing protections found in iOS. Whenever an application attempts to access the files inside certain newly-protected directories, macOS asks the user whether they want to allow the application to access the content in those directories. 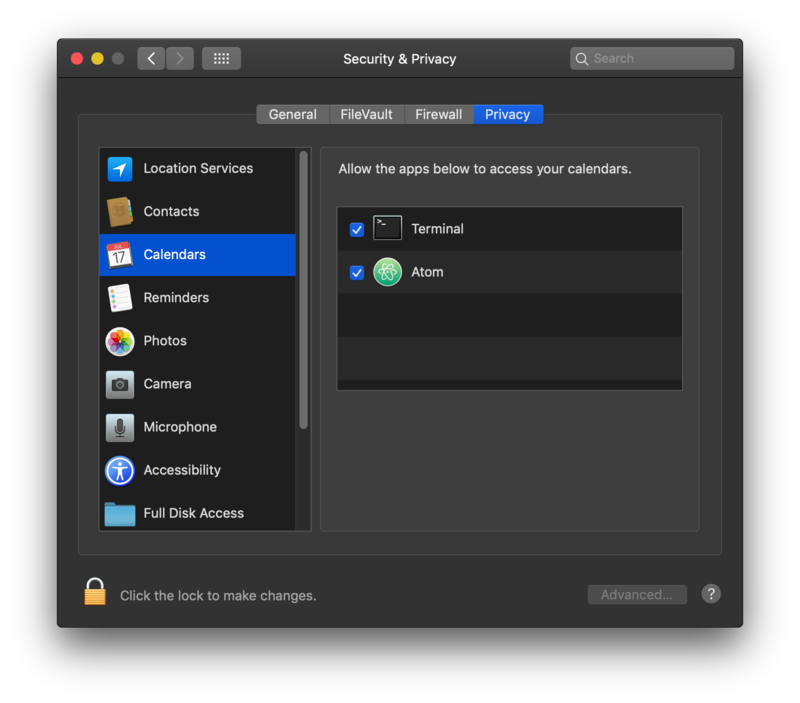 These new privacy protections apply to the directories that contain your calendars, contacts, photos, mail, messages, and Time Machine backups. 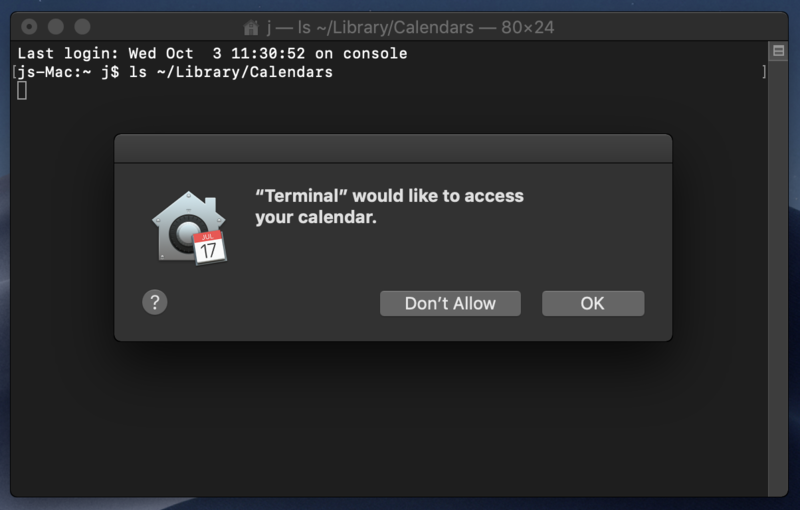 Why does Atom need access to my calendar, contacts, photos, etc.? Similarly, using find-and-replace across the entire home directory will cause Atom to scan all files under your home directory. Before letting Atom read these files, Mojave is understandably asking whether you want Atom to be able to access this personal data. What should I do when I see these prompts? Most people don't use Atom to view or edit their calendar files, contact files, photo library, etc. If you don't intend to use Atom to view/edit these files, then Atom doesn't need access to them. If you see a prompt from macOS saying that Atom would like to access these items, simply click Don't Allow. What happens if I allow Atom to access my calendar, contacts, photos, etc.? To Atom, these items are just files on disk. Atom treats them exactly like any other file you would view in Atom. Therefore, if you allow Atom to access these items, you'll be able to use Atom to browse the directories that contain these items, and you'll be able to view the files in those directories. That's it. Nothing more. Fortunately, macOS will only prompt you once for each type of personal data. In other words, you might see a prompt asking you whether Atom can access your calendar, and you might see a prompt asking you whether Atom can access your contacts, but once you make those decisions, you won't see those prompts again. What if I never want to see these prompts?